He’s more used to partying all night than getting up bright and early but X Factor star Rylan is making the move into breakfast TV. While our very own columnist Richard Arnold takes a break to visit Lapland with the Wish Upon A Star charity, outlandish Rylan will step into Dicky’s shoes on Daybreak and present all the latest showbiz news. 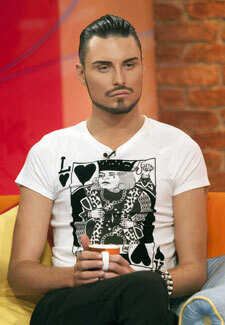 ‘I can’t believe it!’ says Rylan. ‘I only left X Factor a week ago and now I am joining Lorraine and Aled on the Daybreak sofa. I’m a massive fan of the show and it’s going to be so much fun sharing all the showbiz news and gossip with the nation each morning.